Feet play a significant role in today’s fashion and in your daily beauty routine, and what are feet without their toes? Regardless of seasons and events, your tiny toe nails should be ready for any occasion. If you have in mind wearing comfy flip-flops, sandals or stylish peep-toe shoes, you should pay attention to your feet, especially to your toes. You should place importance on the hygiene of feet, keep them well-cared and healthy, have them periodically pedicured. Foot maintenance is required not only for beauty but for the general health. Keeping your feet healthy and beautiful is a big job! 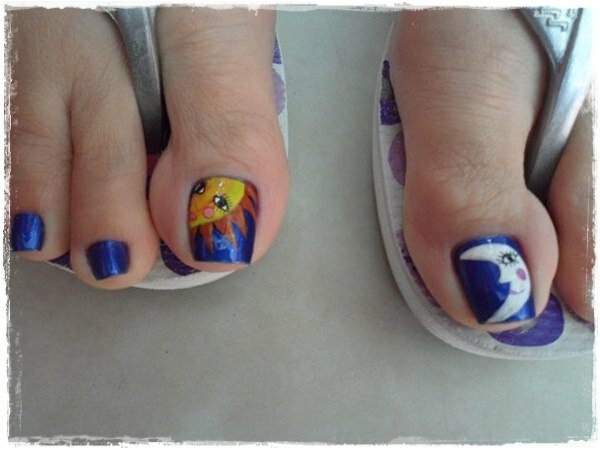 Nail art for toes is growing up, day by day, which offers a wide range of designs. 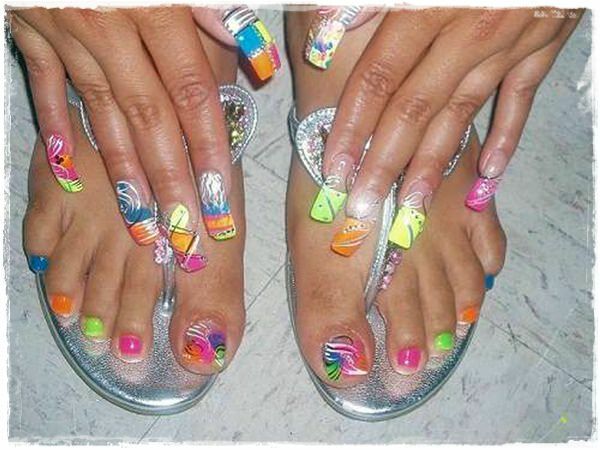 You can match your toe nails both with your finger nails and with your footwear and outfit. It is our ultimate goal to achieve the perfect match between our toe nails, finger nails and the clothes we are wearing. 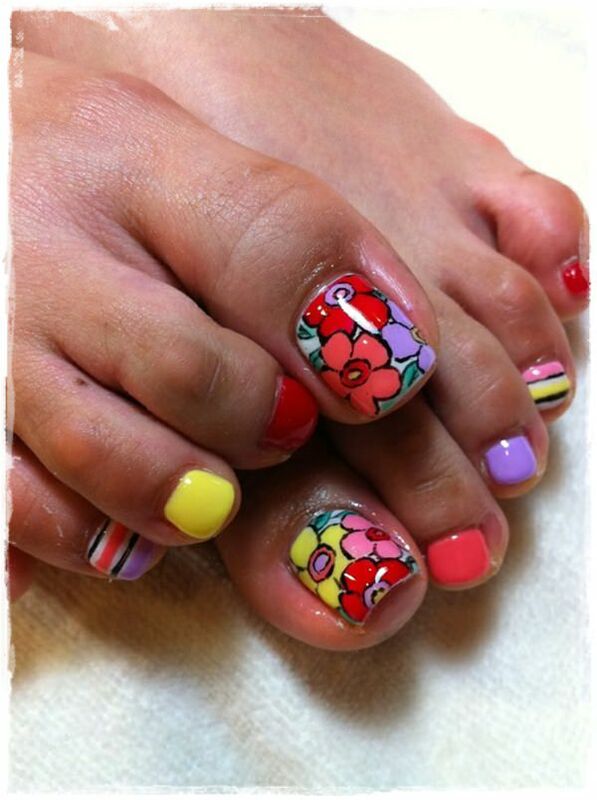 I’d like to show some toe nails design which will definitely make you go to the nail beauty & spa saloon. You can try some of them at home, if you think your toes are well-cared enough. Don’t forget to add a top coat for protecting them! I want to start with an easy one to inspire you to pick up some nail lacquer bottles, and a toothpick for this design. Polka dots are as easy as pie. Just paint the nails and add some dots with the tooth pick. The colors of the base coat and dots are up to you, so this design can be adjusted for any shoe and outfit as well. Depending on the shoe type, this design could even be used in formal events. This design reminds me of 50s’ polka dotted petticoat dresses. For a simple flower pattern, you just need five dots as petals all together. You can add a few rhinestones or another dot with different a color, to the middle of the )flower. Thumbs are the best canvases for such flowers. Such floral designs create a spectacular combination with dresses in the spring. On this design, pink and white, contrasting colors, are used. Stripes are always easy to apply, which only require nail lacquers with a color of your choice and sticky tapes to mark off. 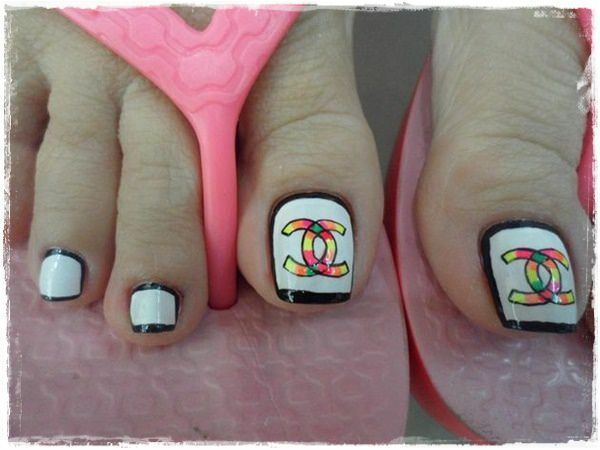 Because of the littleness of the toes, this cute design, like the others on toes, demands more patience. This design looks so cute, which is composed of blue tones, white, black and glitters. There are many shades, so you should be careful on your clothes’ color tone. Pink or yellow clothes, for example, are a bad choice. If you are in a hurry and want your toe nails look stylish, you just need some cool stickers, which are suitable both for hand nails and for toe nails. Applying sticker on the toe nails doesn’t require special care, just stick them on your nails then add the top coat. It’s done! 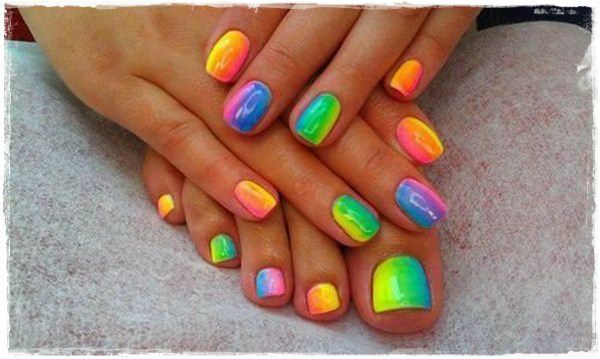 Contrasting vivid colors on toes make a good look. You can make them better by adding some stickers. This applied black stickers deal with Barbie, and also the color selection, pink and white, is matching girly Barbie’s theme. Drawing stars is actually very easy, it just needs some practise. You can just draw the stars on your thumbs and leave the others blank, because they are so small that stars may not fit perfectly. If you want other toes look more stylish, then you should consider gluing rhinestones, bindis and adding some dots. The shiny white and navy blue background, together with these glittery stars, is screaming party. 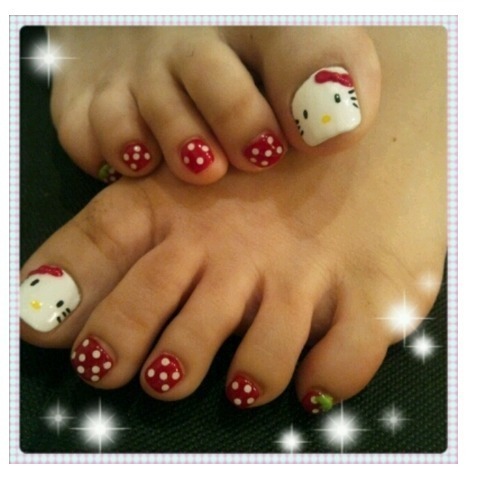 Just because Hello Kitty is quite popular among little girls, it doesn’t mean we can’t use them in our daily life. The design is generally composed of polka dots. On the thumbs, there are Hello Kitty print. The strawberry pattern on the pinky is increasing cuteness level over 9000. Including Hello Kitties, the whole design is easy to create. You can be expert at drawing Hello Kitty after a few tries. Flowers are the harbinger of spring. You just need some colorful nail lacquer bottles to draw some splendid flowers. You can try using some floral stickers too. On this design, skin tone is used as base coat. Flowers on thumbs are insignificant because of their colors. Using glitter adds an eye-catching effect. This nail art is kinda no nail lacquer-lacquer that’s why this design can be used with every combination anytime. However, I can suggest using the floral designs to combine with dresses, especially in the spring, or clothes with flower prints. Christmas Tree! Santa Claus! Ornaments! Ginger Cookies! Reindeers! Red Starbucks Cups and Christmas Drinks! Yeah, who doesn’t adore Christmas and home parties at Christmas? This design is absolutely perfect for Christmas celebration. You needn’t actually any preparation for Christmas: outfit in shades of red or green, optionally a Santa hat or headbands, and stunning nails. This design about Christmas is the number one for who looks for nail art ideas for Christmas. There is no such rule that classic french manicure can’t be applied to toe nails. Who loves simplicity and elegance together, should have this nail art on theirs. They look very natural, cute. French manicure offers you stylish elegance for any occasion and event. The base coat is usually pale pink or clear. Then comes the painting straight lines on nail tips with white polish. It is vital to apply the top coat thereafter. Your gorgeous French manicures are ready to shine! You can add some glitters, some tiny stickers or rhinestones to decorate.